The price gap between South Korea's most expensive apartments and its cheapest ones widened to a more-than-seven-year high last month amid an overheated urban real estate market, industry data showed Sunday. According to the data compiled by Kookmin Bank, apartment prices in the top 20 percent group reached an average 694.1 billion won (US$621,000) last month, up 22.3 million won from a month earlier. Prices of apartments in the bottom 20 percent band fell 610,000 won on-month to an average 115.3 million won in October. As a result, the ratio of prices between the two groups came to 6.0 in October -- the largest since August 2011, when it hit the same level. The widened gap was driven by the rapidly rising prices of premium apartments in major cities like Gwangju, Daegu and Daejeon outpacing those of low-priced flats. 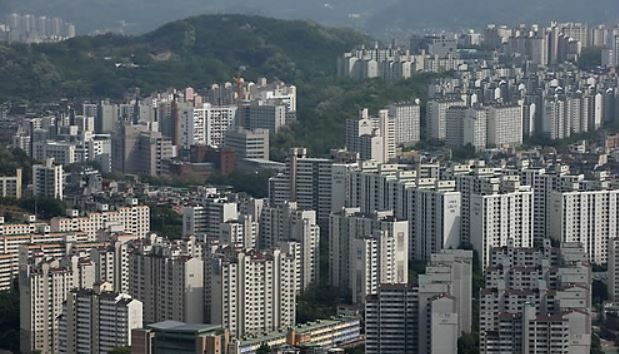 For example, the most costly apartments in the southwestern city of Gwangju averaged 473.5 million won last month, up 16.8 million won from a month earlier. But the lowest-value group of apartments saw their prices rise 50,000 won to 100 million won over the cited period. On the other hand, the data showed that the trend went in the opposite direction in Seoul, as the capital city was the target of government anti-speculation measures that included a hike in real estate sales taxes.